BMW Active Hybrid 5 review | What Car? The BMW Active Hybrid 5 is based on the 5 Series executive saloon, and is the first BMW hybrid to be offered in right-hand-drive form. It combines a 54bhp electric motor with the turbocharged 3.0-litre petrol engine from the 535i, giving it a total of 335bhp and 332lb ft of torque. At 46,860, the Active Hybrid 5 does carry a hefty 7920 premium over an SE-spec 535i. However, it comes slightly better equipped and averages 44.1mpg to the 535i's 34.9mpg. What's it like to drive? At speeds of up to 37mph, the Active Hybrid 5 can run on electric power alone for almost 2.5 miles - as long as there are no inclines and you're very gentle with your throttle inputs. Alternatively, put your foot down hard, and the electric motor assists the petrol engine, giving the car strong performance and plenty of overtaking punch. The switch between propulsion modes is so smooth that you hardly even notice it. What's more, if you programme your destination into the standard sat-nav system, the Active Hybrid 5 can factor in the topography along the route to help maximise efficiency. If it knows that you're approaching a downhill section where it will be able to recharge the batteries, for example, it will let the electric motor provide greater assistance beforehand. Clever. Despite the added weight of its batteries, the Active Hybrid 5 also strikes an excellent balance between comfort and agility, although our car was equipped with BMWs optional Variable Damper Control system; in our experience, 5 Series models with the standard suspension are nowhere near as good to drive. It should also be noted that our test car was fitted with 18-inch wheels and performance tyres - an option that cuts fuel economy to 41.5mpg and pushes CO2 emissions up to 160g/km - whereas 17-inch wheels with low-rolling resistance rubber are standard. Like all 5 Series models, the Active Hybrid 5 feels very stable at speed and is excellent at shutting out wind and road noise. What's it like inside? Aside from a couple of readouts on the dashboard that show how the hybrid system is working, it looks like any other 5 Series when you climb inside. The cabin is spacious and beautifully built, and most of the car's functions are controlled through BMW's user-friendly iDrive system. The only significant difference is in the boot, where capacity drops by 145 litres because the battery pack that supplies the electric motor with power is positioned behind the rear seats. The 375 litres that you're left with is considerably less than you get in a 3 Series. Should I buy one? The Active Hybrid 5 is a fine car, and one of the best hybrids around. 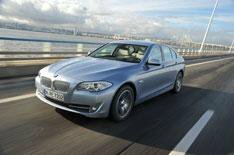 However, it's still hard to argue a case for choosing it over a diesel executive saloon. BMW's own 535d costs 2570 less to buy, plus it's faster, cleaner and more practical than the Active Hybrid 5, and averages an extra 8.2mpg. Yes, the Hybrid 5 will cost you fractionally less in company car tax, but it's not enough to offset the higher fuel bills.